The main difference between client and server is that a client is a machine or a program that requests for services through the web while a server is a machine or a program that provides services to the clients according to the client’s requests. World Wide Web (WWW) allows computers and other devices to communicate with each other. The devices in the network require obtaining various services including data and resources. The WWW works according to the client-server model. The devices or programs that require services are called the clients, and the devices that provide services to the clients are called servers. The clients initiate communication sessions with the servers. The servers wait for incoming requests and respond to them. A client can be a device or a program. A client device is a machine the end users use to access the web. Desktops, laptops, smartphones, tablets are some examples of devices. A client program is a program that allows the user to make requests through the web. One example is a web browser. 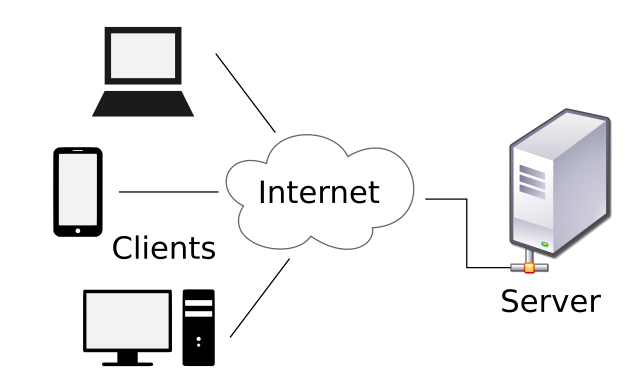 A user can request for a web page through a web browser. Moreover, the programs that can get online support, themes etc. can be also considered as clients. A server is a device that provides services to client requests. These devices run server programs. A single server can provide services to multiple clients simultaneously. Usually, servers run continuously. There can be multiple servers in a single machine. For example, there can be both web servers and file servers running at the same time to sever different clients. It is also possible to have the client and the server in the same machine. A server consists of web resources, host web applications, and stores program data. There are various types of servers. Web servers provide web pages. Database servers run Database Management Systems (DBMS). File servers provide computer files. Some servers provide shared resources to the clients. Server always listens to requests from clients. When it receives a request, it responds to that with a message. Together, the client and server form a mechanism for the devices in the network to communicate with each other. Both of them create an architectural model for the web, which works according to the request and response cycles. A client is a device or a program that requires services via the web. A server is a device or a program that responds to the requests of the clients by providing services to them. A client requests the server for content or service function. Server provides functions or services to the clients when the client request for services. That is a difference between client and server. Desktops, laptops, smartphones, tablets and web browsers are some examples for clients. Database servers, file servers, and web servers are some examples for servers. 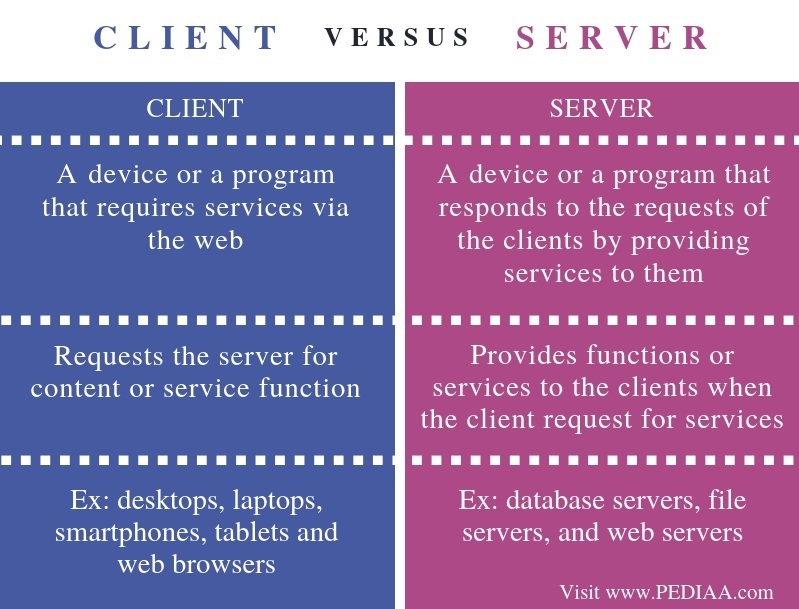 The difference between client and server is that a client is a machine or a program that requests for services through the web while server is a machine or a program that provides services to the clients according to the client’s requests. Both client and server allow the devices in the network to communicate with each other. 1. “The Client Server Model”, Clients and Servers, WebDev Cave, 20 May 2016, Available here. 2. “Client–Server Model.” Wikipedia, Wikimedia Foundation, 24 Aug. 2018, Available here.